Isn't it really annoying when you see lots of buses going the other way while you are waiting? It really seems to rub it in! Tonight I was waiting for a bus at Leigham to make the short journey home to Keswick Crescent. I could have walked it in 10 minutes, but it was dark, damp and my son was tired so I was happy to wait 10 minutes or so for the 50 which was due at 18:00. In the end it turned up at 18:12. This was our steed home tonight. Like I said, I don't mind that, it has to come from the City Centre at peak time so late running is almost inevitable. What was really annoying was that in the twenty minutes we were waiting we saw a Target Travel 52A, a Citybus 46, and no less than THREE Citybus 50's going the other way! The 50s all came within 10 minutes which just made it worse. This isn't a complaint at Citybus. (On the way home from Derriford there were two Ugobus 15's following each other out of Asda so it happens the them too.) If you run a bus service which goes anywhere near Derriford Hospital it must be almost impossible to run to time. Last month First claim to have managed to run 88.4% of services on time. To be honest I find that quite impressive if its a true reflection. How anyone manages that in Plymouth amazes me. We are just about to get extended road works along the main road through Crownhill for a few months so it is going to get even worse then! (Hopefully the improvements they are making will help once they are completed next year). I have just been reading the latest Omnibuses post ‘Mystery Shopping’ and noticed a comment from Big G: ”Passenger Focus are currently conducting similar monitoring and research in the South West. I am aware that they started this in Plymouth on the 2nd November.” It will be interesting to see the results of that! 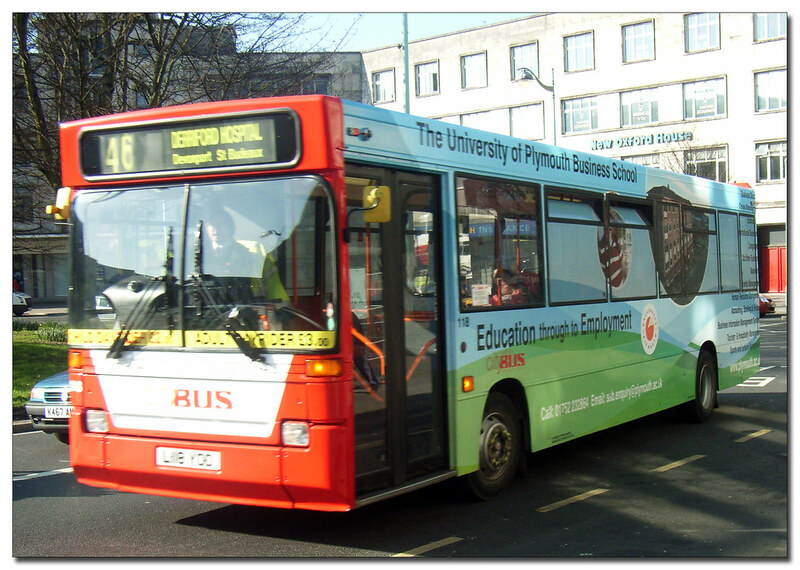 How many bus stops in Plymouth are actually fitted out with some form of Real Time Display? Plymothian Transit: Oh what a circus! The whole area was in chaos yesterday afternoon for no obvious reason. God help us when the work on Tavistock Road starts. Oh, and of course the major works in the hospital which takes out the top car park, makes the current western end exit road one way and buses only, and diverts most traffic out of the Hospital via Morlaix Road and Brest Road. Deep joy! Your question should also say - how many of the stops fitted with real time informtion actually work. I think you will find it's very few, most only display timetable information if anything. But hey, it's only been in Plymouth for nearly NINE years. What a wast of money. The situation is no better in the other direction: I usually catch the 17.05 46 service at the Vets in Mainstone to get home to Lower Compton. The last two days the bus has arrived nearly 30 mins late. The Drivers are very appologetic for the late running due to it taking then 25 mins to clear Derriford Hospital. No point ringing the Citybus Customer Services as I beleive there is only one person to deal with the calls.Its about time all parties sat down and sorted the Derriford situation out once and for all !